Produced by Grouch & Eligh, Fat Jack, and Epic. This is my first real exposure to Grouch and Eligh, and I'm already kicking myself for ignoring the Living Legends crew for so long. Pure and simple, this album is fantastic. 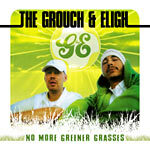 Grouch and Eligh possess a ridiculous amount of talent in the way of lyrics and delivery. One of the most alluring points about the lyrics are the fact that they aren't filled with an abundance of 10-cent words and battle rhymes. They speak out on real life issues. They compliment each other's flows beautifully, which plays off the production in an untouchable fashion. In turn, the lyrics sound fresher, and the lyrical topics are packed with original ideas. The best way to describe some of these tracks is gorgeous. "Everafter" has a seriously addictive loop that blends perfectly with G & E's seamlessly unstoppable flows. "Just For You" featuring Basik MC & Bicasso, with guitar by David Goodlett boasts some pretty exciting head-nodding production. "Mr. President" has some interesting political commentary (obviously left-wing). I enjoy this lyric from the Grouch - "I don't want to wake up to a bomb in my backyard / Mr. President, quit talkin' for me / I shouldn't have to be 60 and flat broke / The way it set up ain't lookin' out for we". One of the most beautiful tracks on the album is the title track - "No More Greener Grass" featuring Pigeon John. DJ Epik's production is bumping and soulful, which compliments the addictive chorus. "Emotion" also remains a favorite. Overall, there isn't a wasted track in the bunch. To sum it up, the album is very accessible, contains addictive choruses and hooks, but still manages to keep that west coast underground feel. Everything here is far from abstract. Just real music and real lyrics from real artists.